That’s 139 books in 2008 (the first full year I kept track), 133 books in 2009, 115 in 2010, and 124 last year, in 2011; it’s an average of 9.5-11.6 books per month. 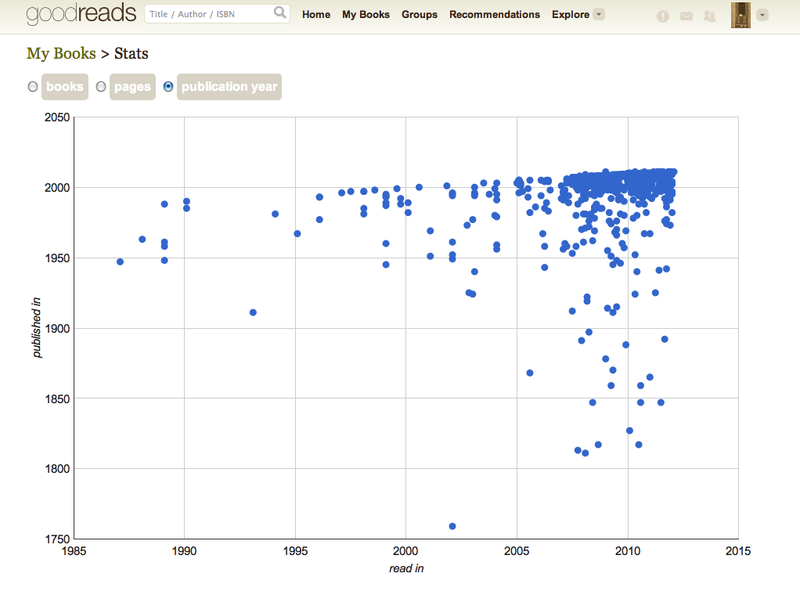 Finally, it creates a scatter plot of the publication dates of books you’ve read, with the pub date on the y-axis and the date you read the book on the x-axis. There’s a pretty dense cluster around the late ’90s and early 2000s, which makes sense as I read a lot of contemporary fiction, but there are some older books too, back as far as the early 1800s. What statistics don’t tell you, of course, is anything about content. Which books did I love, which would I read again, which would I recommend? I’m glad you asked! I read a number of books I loved in 2011, and I’ll share those here soon. Meanwhile, here are some favorites from 2009 (I seem to have skipped a write-up for 2010): nonfiction, poetry, plays, and young adult fiction; short stories, classics, and “re-reads”; and fiction. I love the cluster map, and I love goodreads. Let’s be friends.